Proposition 13, the tax revolt measure is now under attack. A new initiative that would lift caps on property taxes on commercial and industrial properties will be on the 2020 November Ballot. The initiative would create a "split roll" system, leaving in place the caps on home property tax while removing the protections for commercial and business properties. All Commercial and business properties could be taxed at fair market value. 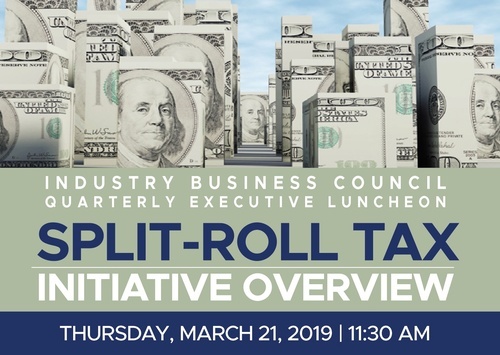 On Thursday, March 21st, join the Industry Business Council at its Quarterly Executive Luncheon, in an effort to increase awareness of the impact this initiative may have on California businesses. IBC welcomes guest speaker Jon Coupal, President of the Howard Jarvis Taxpayers Association (HJTA). Mr. Coupal will share the history of Prop 13 and important information regarding the negative financial impact the proposed split-roll initiative will have on all California businesses and communities. Attendees will also learn how split-roll will impact not just property owners but consumers and the harmful impact split-roll will have on the state if the proposition passes. California voters will have the opportunity to cast their votes on the highly contested split-roll initiative in November 2020. California currently has one of the highest property taxes in the nation and the proposed $11 billion split-roll property tax will drive property taxes even higher. Join us for this informative luncheon and register today. Before being President of HJTA, Jon served as Director of Legal Affairs for the organization from 1991-1998, overseeing the organization’s litigation and lobbying efforts. He is a recognized expert in California fiscal affairs and has argued numerous tax cases before the courts. Jon is a graduate of the Marshall-Wythe School of Law at the College of William and Mary, where he received his J.D. degree in 1982. After law school, he was an attorney with Pacific Legal Foundation for nine years, specializing in tax issues and political law.